Frangipane, in case you are unfamiliar with it, is a cakey almond paste that is used as a filling for many types of cakes, cookies, pies, tarts, and bars. It's made with ground almonds, and has a lovely aroma without being too rich. The texture is similar to a soft shortbread, but the flavor is that of vanilla almond. Really quite delicious paired with fruit.I think it originated in English desserts before becoming popular in French and other European cuisines. I am back home for the long weekend, so I had to come up with something to bake of course. 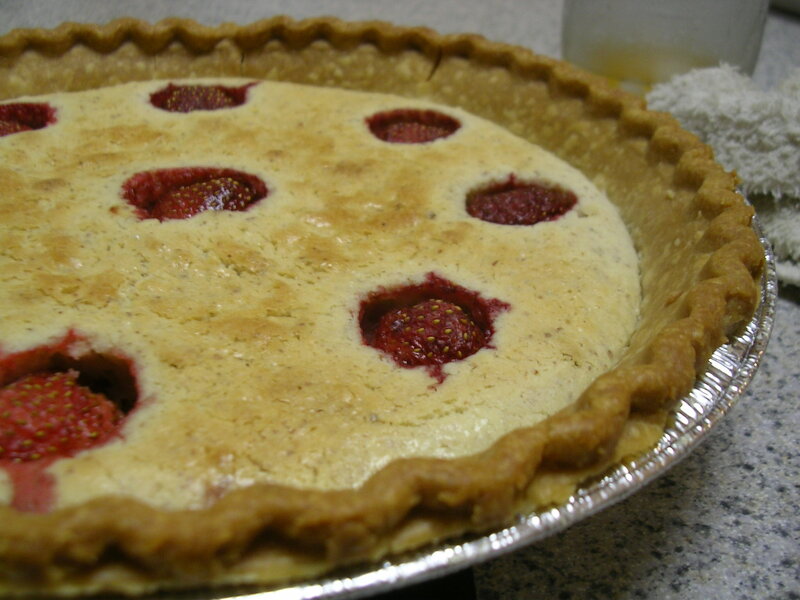 I had frozen pie crusts and some frozen strawberries, so I chose this recipe to make. Plus it's super easy. Unfortunately, you'll see that the frozen strawberries were not a great idea, but I assure you the rest of the tart was fantastic. It's the frangipane that really takes center stage in this one! It was moist and soft, great enjoyed warm but also nice when it's cooled off. 1. Preheat oven to 375 degrees F. Thaw pie crust for 15 minutes. Prick bottom and sides with a fork, and bake for 8 minutes until edges turn a light golden color. Remove from oven and allow to cool while making filling. 2. In a food processor, combine almonds, flour, and sugar. Process until very fine. Cut in butter and pulse to incorporate. Add in eggs one at a time while processing. Also add in vanilla and almond extracts. The final product should be like a batter. 3. 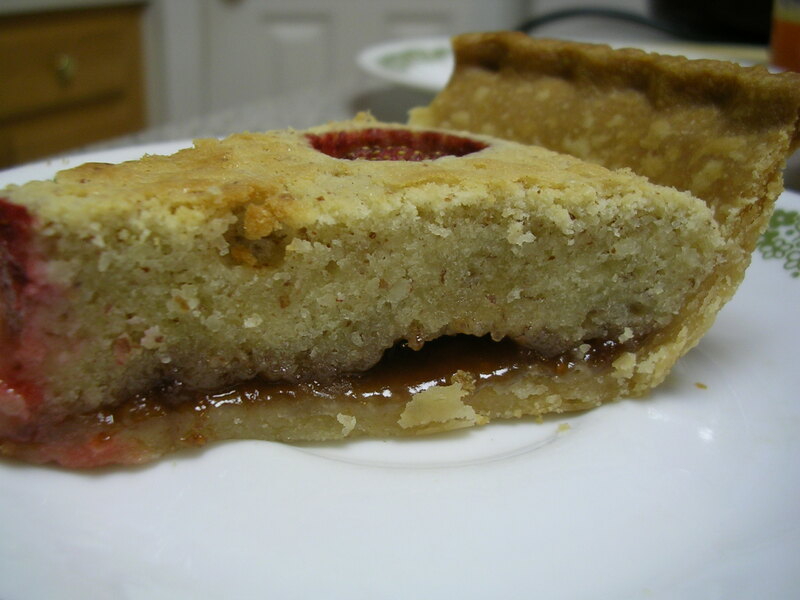 Spread a generous layer of jam on the bottom of the pie crust. Spread almond paste on top and smooth over. 4. Top with fresh fruit for best results (I used a few frozen strawberries). Bake at 350 degrees F for about 35 minutes or until filling is firm and golden. (If crust edges start to brown, cover edges with foil to help prevent them from browning. Remove and cool slightly before serving. So about the frozen strawberries… they exuded a lot of juice as they thawed during the baking process. That's why you see the rings of red liquid around the strawberries. They also lost all semblance of chew, and were very sour. It was like biting into a little pouch of sour juice. Really not a good fit for the pie. I think the jam went great with the frangipane though, and if I just had used some slivered almonds on top for garnish, or baked with some fresh ripe strawberries, this result would have been much better. But yeah, the pie was really yummy otherwise! I suggest serving it with whipped cream or ice cream. Cheers! This entry was posted on Sunday, October 7th, 2007 at 6:32 am	and posted in baking, desserts, Uncategorized. You can follow any responses to this entry through the RSS 2.0 feed.